Photo by L(Phot) Barry Wheeler/RN. A hard power era demands Tier 1 naval capabilities. 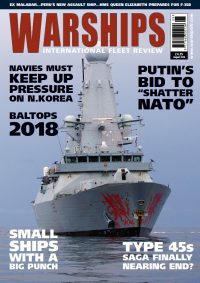 UK naval news with an accent on politics & strategy, also including ‘defence fudge’ likely, ASW weakness highlighted, Type 45 destroyers. A naval fighter pilot suggests fixed-wing rebirth is being hampered by the land-based air arm’s deep involvement. History repeats itself in ‘no jets on UK carriers’ argy-bargy. US Defense Secretary feels Russia & China are disruptors. The saga of poor UK destroyer availability nears its end. Mothballed USN frigates are being offered to Lisbon. Vigilance at sea is needed despite Trump-Kim summit. No lack of commitment to challenging Beijing at sea. As Russia watches from the sidelines the USN projects power. The first proper RAS is latest step in RN carrier trials. Preparations for the first F-35B embark are underway. South America’s biggest ever ‘home-built’ assault ship. A look at the world’s well-armed corvettes. The Babcock-led proposal for the UK’s T31e frigate. Last of the U-boat aces, who told Hitler off & Canadian air ace who took on the kamikazes.